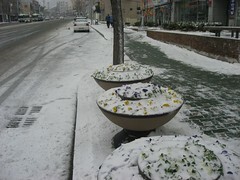 It snowed this week in our part of Busan. It was the first time snow had settled on the ground since I've lived here. South Korea hasn't had an easy winter, but this city's location and our location within it - in the south-west by the sea - mean that it usually rains, if anything. The snow still falls on top of the nearby mountains though, which I have an excellent view of from my office window. 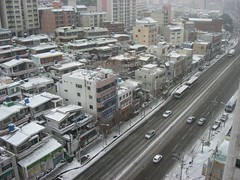 Annoyingly, it often doesn't stop it from being bitingly cold, but it's nothing compared to Seoul. Our dog was captivated by what he saw out of the window, and outside our building a group of children, whose school was apparently closed by the weather, bravely tried to scrape together enough of the white stuff to build a snowman. I imagine this was their first and last chance of the season, and it was clearly hard work. I had to go to the maternity hospital with my wife the day of the snowfall, because she had an ultrasound scan scheduled. There was no more than two centimetres of snow beneath our feet, but somehow the main road had become treacherous. When a taxi driver saw us, he apparently knowingly applied the brakes about ten feet away in order to slide to a stop beside us. It was clear that most of the road was ice - there had been no attempt to grit it. As we skidded our way terrifyingly towards the hospital, it was clear that few drivers were prepared to compromise their driving style to accommodate the dangerous conditions, so regularly changing lane and cutting up people who couldn't necessarily brake effectively was commonplace. The saving grace was that the roads were so jammed with traffic, so nobody was able to go very fast, meaning the hundreds of accidents which doubtless occurred should have been minor. Our doctor had not made it to the hospital - he was stuck in traffic - but we were able to see another, who at the end of a long conversation I barely understood asked if I had been bored. I'd tried to look attentive while fighting the constant tendency I have in Korea to zone out, but my lack of comprehension had somehow been detected or correctly assumed. It's unfortunate that my Korean ability has not progressed sufficiently, because this is a time when I want to understand every word and subtle nuance of the ongoing diagnoses, but instead all I can do is read the body language for any sudden negative revelation. It's incredibly frustrating. The hospital gave us a DVD after the ultrasound. We hadn't had one after previous scans but this was a big one which incorporated a '4D' imaging technique which is supposed to be more comprehensive. The DVD contains a software application - Windows only of course - from which it's possible to view the ten minute ultrasound video, still photos and a general yoga video for pregnant women alongside some hospital advertising. We'll take the DVD back with us as the pregnancy progresses and they will continue adding to it until the baby is born. It's all part of the package but it's still a very nice touch. A friend of ours who's also pregnant has chosen a much bigger general hospital - as opposed to a specialised maternity hospital - where they don't do this, which seems a pity. Having the video has enabled us to share it with family back home to make the pregnancy more real to them than it would otherwise be, given the geographical difference. Everything is fine and we continue along the road of the Korean pregnancy experience. It's great to hear that everything is progressing fine, though I can only imagine how frustrating the language barrier must be. The DVD seems like a very nice touch--especially as you say, since family are not able to share the journey with you. I stay in the Haeundae area. Greatly appreciate your help! 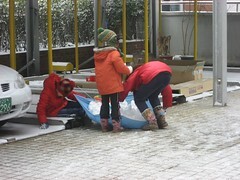 By the way, the snow day was really marvellous! 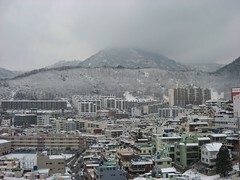 I feel so lucky to be here to experience the rare snow of Busan! I'm working at the moment but I'll look into that for you. It's a hotel/day-care centre/training company. The prices look quite reasonable for the hotel (10,500 per night). The links above are all to proper dog hotels - quite often vets and sometimes dog grooming shops here can provide a kennel service for a fee but it's generally a lot more basic, but it might be worth looking into as an alternative. No problem Chloe. I'm afraid I made a mistake with the Alf School - it's 15,000 per night, not 10,500 - a stupid translation error on my part - but I still think the cost is reasonable. I see you are doing a fantastic job of updating your blog so very regularly. 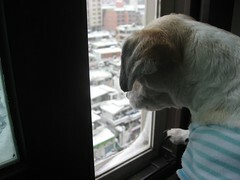 Reading your articles actually help me some in knowing more and adapting to Busan.